The latest activities in Aktau port and strategic plans have been discussed between Mr. Mircea Ciopraga, Secretary General of the PS IGC TRACECA and Capt. 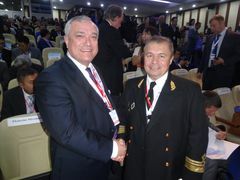 Mr. Mikhail Yalbachev, President of the National Company of Aktau International Sea Trade Port. Aktau port was completely reconstructed the ferry complex enabling wagons to be rolled in and out passing in direct combined railway-water traffic. This allowed expanding the assortment of handled cargo passing through the port of Aktau. Opening of this connection allowed carrying producers’ cargo from Central Asian countries and China. Presently the port generally functions to the limit of its capacity making 11 million tons. On the outcomes of 2014 the port handled 10267.0 thousand tons of various national economic goods. During the discussion between Mr. Ciopraga and Mr. Yalbachev it was emphasized that within the TRACECA implemented project “Master Plan and Technical Feasibility Study for Development of the Port of Aktau, Kazakhstan” the port will be able to increase its capacities to more than 20 million tons of oil cargo and up to 3,2 million tons of dry cargo. In addition to the expansion of the port of Aktau in the Northern direction there were determined the prospects for the development of the existing sea port of Bautino and the port of Kuryk which is currently established. The construction of a new ferry terminal started in the port of Kuryk. This terminal is targeted at intensive servicing of ferryboats with one-time handling of two boats. A yearly capacity of the terminal is estimated at 4,0 – 4,5 million tons of cargo. The tentative commissioning is scheduled for 2016. In the port there was created a transport nodal point for several modes of transport, such as railway, road, water and pipeline.